Enjoy Montana's Big Sky Country in comfort! 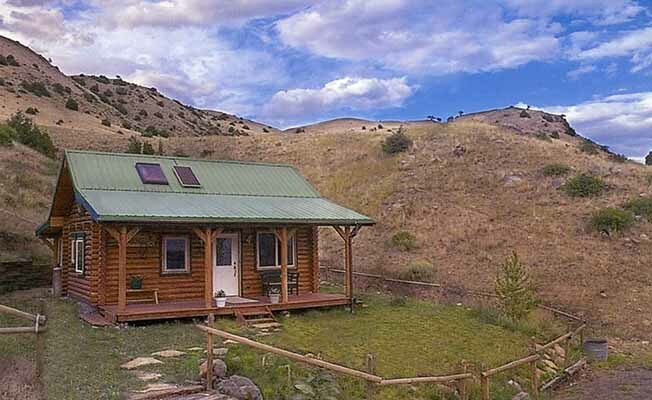 Our Montana Retreat Cabin has all the amenities to make your stay relaxing, refreshing and memorable. Sleeps 2 - 6 people Thermostat controlled gas metal fireplace Fully-equipped efficiency kitchen Outdoor propane grill Full bath with shower Master bedroom suite with queen size bed Sleeping loft with a double size futon bed Futon couch (double size) in living room Linens, fluffy comforters, extra pillows, towels provided CD/cassette player with music library Small TV with DVD and video player Pet-free and smoke-free environment Just five miles up Highway 89 is the Emigrant crossroads with its gas station, general store, post office, Laundromat, cafés, gift shop, and fly fishing shop. Livingston has two grocery stores to stock up on food for your stay. The Emigrant General Store carries many health food products as well a health food store in Livingston. Vacation Packages Available To Add To Your Rocky Mountain Experience: *Healing Retreat: Turn your Montana vacation retreat experience into a wellness vacation with acupuncture or CranioSacral work. *Horseback Vacations - The Kremers (and their horses) are trained in Parelli Natural Horsemanship. Natural horsemanship lessons available at the cabin. You can also take trail rides at nearby Paradise Valley ranches or Chico Hot Springs. Horse lodging available. Wake up, walk outside and discuss the beauty of the sun rising over Emigrant Peak with your horse. Our irrigated pastures stay green all summer.